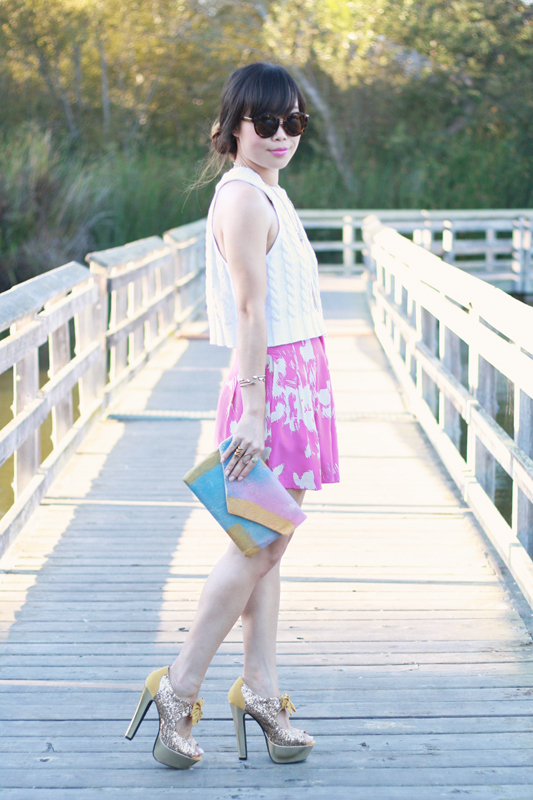 I wanted to create a fun look by bringing out the amazing colors seen on this clutch by My A La Mode. I chose a lovely vintage cable knit crop tank from Vintage Scandal, just like you would with a painting by starting with a white canvas. I paired it with these chic and comfy high waisted silk shorts by Yumi Kim, matching fuchsia lips, and sparkling glittery heels! Vintage cable knit crop tank by Moda Int'l c/o Vintage Scandal. 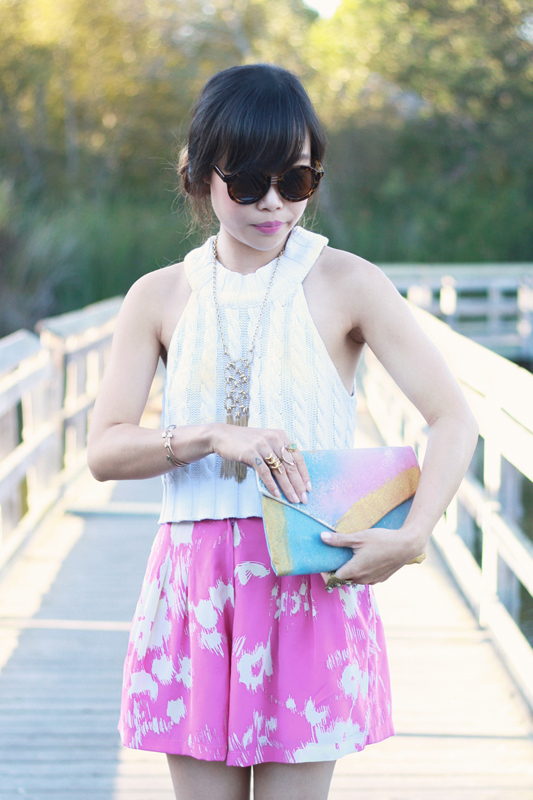 Monroe fuchsia silk shorts c/o Yumi Kim. Glittery bow heels by Promise. 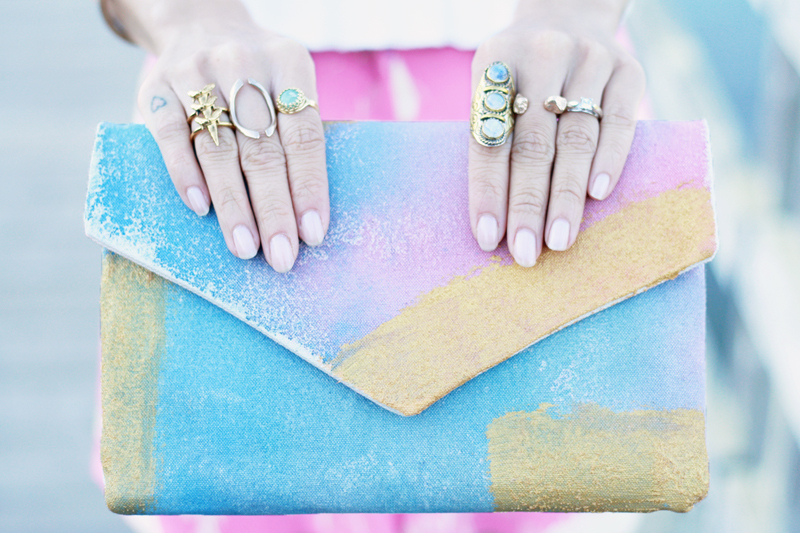 Hand painted clutch c/o My A La Mode. Chain link tassel necklace c/o Sole Society. Paragon cuffs c/o Tiffany Kunz. Triple shark tooth ring by Luv AJ. Bold arc ring c/o Tiffany Kunz. Priya amazonite ring c/o Eclectic Eccentricity. Triple moonstone ring c/o St. Eve Jewelry. Golden nuggets open ring c/o Femme Mecanique. Love that bag! So cute. Ooo, those shoes are adorable!